The end of the 80’s, beginning of the 90’s. MTV still played music videos, and the first Gulf War was still in the future. I arrived at college and threw away my curling iron and hairspray. Just a glance through my high school yearbook would reveal how BIG an action that was. When I was in college, there was hardly a single guy who wouldn’t try to sleep with me given half a chance. Even if he had a girlfriend, even if that girlfriend was a friend of mine, if we happened to be alone together in a room with a door, he’d try his luck. I understand that this is not atypical. And it will not surprise you to learn that I was the pining sort, my heart hinged on the Unattainable One whose friendly hugs never became more. So I was by and large unresponsive to these efforts. I, obnoxious Atalanta, proposed impossible tasks. This is absolutely true. J. pursued me (why I could never understand, we were so thoroughly unsuited to each other), so I told him that if he could discover and recite the two opening lines of my favorite poem, I’d go out with him. Seriously. Insufferable, yes, but it was a pointed challenge: see how little we have in common? Yet, in the midst of my Unrequited Love, there was one guy I flirted with. He was a little older, with shaggy, weathered good looks: a fledgling poet. P. was on the fringes of our clique, Heathcliff with a sense of humor. Does that capture his appeal well enough? I could have really fallen hard. What kept me wary was that Heathcliff aspect, the darkness I sensed in him. P. struggled with alcohol, I remember him being quite open about it, which was positive, but I felt a world of pain there. So I kept my distance. But we hung out, went on walks, smoking cigarettes together (oh how I loved smoking), talking. He gave me a card, with actual handwritten words inside, for my birthday. Do you have any idea how rare that was? I felt wooed, but gently. Sweetly. One time, on one of our walks, we ran into My Crush, and there was a flash of awkwardness, this charged frisson, as My Crush & I exchanged friendly hugs and chit-chat. Probably all in my overactive imagination, but at the time it seemed momentous. And that’s the point of this long long story, because it’s a rainy overcast Saturday in late September, and it’s been a difficult week, and now I hear that Paul Newman has died — the sadnesses just seem to accumulate. But these small moments, these gifts of kindness and care, jewel-toned memories, they gather too, into a beautiful mass of autumn leaves I can fall into on days just like this one. After what has been a time of submission silence, and week of personal strangeness, this evening I received a clutch of emails from journals, and not an actual rejection among them. One acknowledged receiving my submission (sent 44 days ago), and assured me I’d hear from them again with 4-8 weeks. One apologized for the delay in responding to my submission, and assured me that I’d hear from them again soon. One apologized that I never heard from them last spring (I learned they rejected me from an emailed response in June to an emailed query I’d sent in May — their records indicated mailing my SASE o’ rejection in March. I never got it.). And although I was still rejected, they would love to see more of my work. And each of these emails was sent utterly without provocation — I promise I’ve been patient, and have done no prodding & poking of editors. Curious, these sudden displays of courtesy! All in all, an apt bookend to my week — the holding pattern holds. In other news, today I received my copy of Anne Haines‘ new chapbook, Breach, from Finishing Line Press — very elegant! Into the queue it goes — I can’t wait to spend some time with it. Lea Banks, All of Me: The Launch! We were early, so Vincent & Lance ended up departing for the short walk home before the party really picked up, but not before Vincent scarfed down some cookies & milk. I only wish I’d had more time to hang out with all my poet-friends. 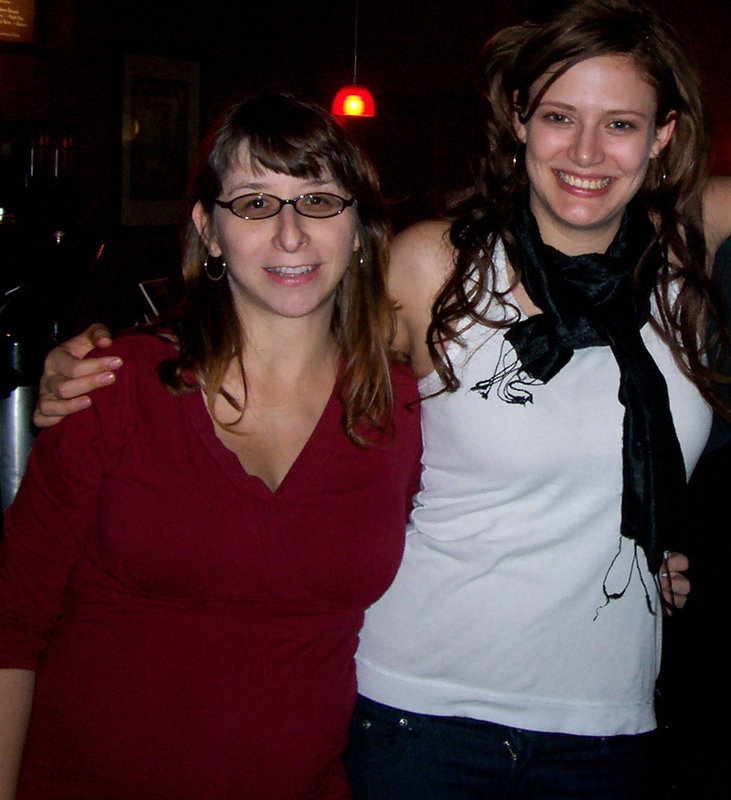 Our day-jobs & lives keep us from meeting up except at these special events, so we never get to really talk for long. But what fun it was to see each other & support each other & chat, in whatever time we manage to eke out. Your mouth, a grand entrance. worn like a victor over flesh. After the long spate of fiction I zipped through this summer, I’ve been unable to get back into novels again. One of the last I read, Pocketful of Names, by Joe Coomer (which has the absolute worst cover, seriously, what was Graywolf thinking? ), I loved so much. I deeply identified with Hannah, the curmudgeonly young artist-protagonist. I haven’t managed, or maybe I’ve been reluctant, to be attracted by the prospects of another novel. Which is fine, because I really read a lot of novels this summer. Long due for some quality poetry time. Parthenopi: New & Selected Poems, by Michael Waters. In preparation for the next Collected Poets Series reading, the first of the new season. Waters will be reading next week with Carol Frost. Should be an interesting mix. A post on Bernadette Geyer’s blog sent me to my bookshelves to find my own copy of Where We Stand (1994). It’s been a while since I read it, and it reminds me of why I fell in love with Brenda Hillman and Eavan Boland in the first place, the reason I like these sorts of collections so much: they inevitably send me off in search of more. And in this case, it sent me back to my bookshelves for another collection of essays, By Herself: Women Reclaim Poetry, (2000) edited by Molly McQuade, which is even bigger and meatier, definitely what I’ve been hankering for. I read both of these books before becoming a mother, so now I have an entirely new perspective on them. I’m still waiting for my copy of Women Poets on Mentorship, but the truth is, our new apartment is so much bigger that Lance was able to get all my books out of storage, and I’ve been rediscovering old beloveds almost daily that I want to reread. I can’t believe some of the great books I’ve got on my own shelves. I feel rich! 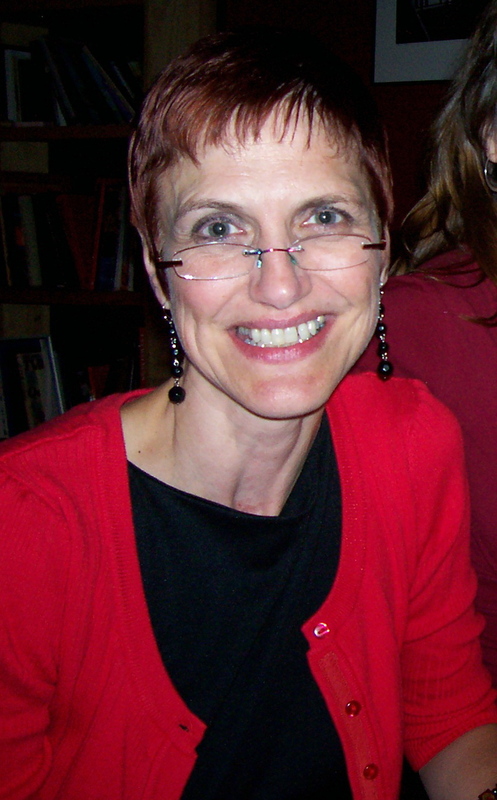 Jonatha Brooke — “West Point”. Because the nights are cold, because this song feels like autumn to me, because I just figured out how to do this tonight, and… because I love Jonatha Brooke. Not only did I get the two reviews I’d committed to writing written (one on Carol Frost, the other on Ellen Bryant Voigt), but I got them done early, a minor miracle. So they were published early. Reading them in printed form, I discovered something I hadn’t noticed in the absorption of writing — both reviews reference grief an inordinate number of times. There have been so many losses of late — David Foster Wallace, Reginald Shepherd — great talents, young talents, I can’t get my heart or mind around them. I’ve also learned that a dear customer of mine, not a young man by any stretch of the imagination, but a great-grandfather, a retired professor who continued to teach his fellow residents in a retirement community (his fall class was to be on Milton), is riddled with terminal cancer. Tragedy leaves me inarticulate, with a mouthful of banalities. As usual, I can only let poetry speak for me. Wind passes over a field of barley. Nothing could be more lyrical. what more he must do to be forgiven. foreshadowed in the first act. Dust swelled behind its four wheels. It was about 3 a.m.. I was sitting up in bed against a mound of pillows, in the dark, unable to sleep due to a bout of heartburn (thank you, pregnancy! ), and bad dreams (ditto!). Driving home from the store last night, I heard a Geico commercial on the radio, the first I’d heard in a while featuring the Gecko. I am very fond of the Gecko. I have not done anything so silly as change my insurance provider as a result of this fondness, but hearing that cockney Gecko’s voice on the radio pleases me to no end. 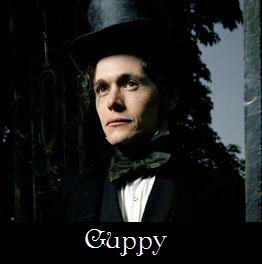 Burn Gorman as Guppy. BBC picture. I have a fondness for Mr. Guppy, too. And that entire BBC production — it aired on PBS during the last weeks of my pregnancy with Vincent and the first weeks after his birth. The two, Mr. Guppy and the Gecko, are inextricably linked to my memories of that time. was removed to a field. a hedge, plums, more than enough.